Nick Rosser in the Geography Department at Durham University has been a long-standing colleague since early 2004, when he kindly let us use his lidar scanner (a 1 Hz MDL instrument!) to start scanning outcrop geology. We’re currently working with Nick on a very interesting project to monitor coastal cliff erosion by repeatedly scanning a couple of specific sites at hourly intervals (using a 122,000 Hz Riegl VZ-1000 at each site). 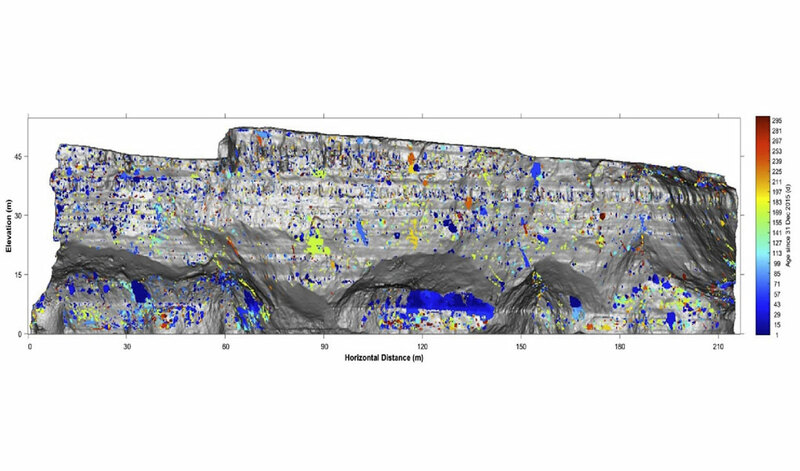 The instrument automatically scans every hour of every day, and uploads the data for processing here in Durham so that hour-on-hour changes to the cliff can be detected and displayed live via a webpage. Nick will be presenting this work at next week’s “3rd Virtual Geoscience Conference (VGC 2018)” in Kingston, Canada, in a presentation titled “Live web-based presentation of 3D coastal rockfall monitoring” (see here for an extended abstract of Nick’s talk).